Some people get into food blogging just to share, while others are hoping to turn their passion into a profession. But while you know your way around the kitchen, when it comes to starting your own website, you might not have any idea where to begin or what questions to ask first. Don’t worry – regardless of why you’re starting your blog, we all have to start somewhere. Whether you’re going to DIY everything, or find someone who can walk you through the process, here’s a list of steps you can take to get your very own food blog up and running with as little bewilderment and confusion as possible. Once you’ve decided on a name, it’s time to buy your domain and make it internet-official! A top-level domain (like a .com, .net, or .org) costs around $10 when you register it using a domain registrar like NameCheap. If you use one of the official discount codes they share on namecheapcoupons.com each month, you can even get a small discount. A penny saved is a penny earned, and every little bit helps when you’re just starting out. From WordPress updates, to security vulnerabilities, to unstable plugins that might break things in ways you don’t understand, WordPress can be a nightmare if you don’t have a trusted partner to help you deal with the issues that come up along the way – and the last thing you want to do is put all of your hard work at risk by leaving it unattended. For some of the best help you can find in the WordPress hosting space, I always recommend building your site on Flywheel, a WordPress-only webhost that will automatically keep your WordPress installation up-to-date, secure, and backed up for you, with a dependable support team that’s available by email, live chat, and even phone. If you registered your domain with Namecheap in the last step, they even have an easy-to-follow guide that will show you how to connect your domain to your Flywheel account. Style, speed, and stability matter when you’re putting yourself out there on the internet, and you won’t find a better combination of all three than the Genesis framework. Developed by some of the world’s foremost WordPress security experts, and featuring an expansive library of themes built by savvy designers for every purpose imaginable, it’s no surprise that Genesis is the most popular starting point for building professional sites with WordPress. To get started, purchase the Genesis Framework and a Genesis child theme to install along with it. 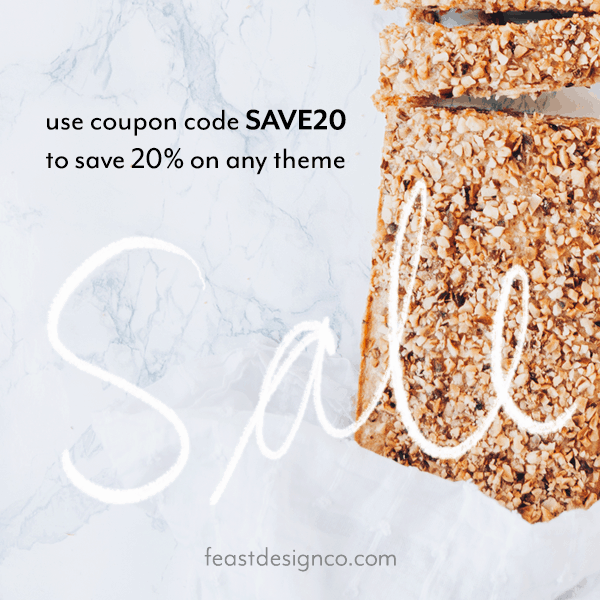 Our favorite pick is our very own Foodie Pro theme (oh hey!) into which we’ve poured all of the design experience and best practices we’ve learned from building food blogs for our own clients. If you’re looking for a theme that puts your best food forward in style, Foodie Pro has everything you need, from font and color options in the Customizer to minimalist style, easy-to-install widgets and an improved recipe index. It’s easy enough to just type recipes into your post in WordPress, but if you’re putting this much work into making everything look good and work well, your recipes deserve the same tender loving care. I always say that you’ve got three options to choose from here: Cookbook Plugin, Easy Recipe, and Meal Planner Pro. Each one is a little bit different, so be sure to weigh the pro’s and cons, but they’ll all help you organize, showcase, and share your recipes in style. 👇 The recipe below was created with the Cookbook Plugin, a collaboration between Feast Design Co. and WP Site Care. It’s been a long process, but now the real work begins – it’s time to start writing! It’s easy to get the hang of publishing posts and pages in WordPress, but if you need a helping hand to guide you through the process, WP101 will teach you the basics in under an hour. When you’re ready to do more with WordPress, it also includes a library of videos that’ll teach you more advanced skills and a forum where you can ask your questions. WANT TO TAKE YOUR BRAND FURTHER? Getting your blog set up is just one part of turning your passion for food into a publishing enterprise of your very own. Ready to get serious about turning your blog into a brand and a business? Check out our Garnish Intense Discovery Workshop, where we lead you through the process of turning your passion into profit. Note: Some of the links above are affiliate links, which means the seller will know that I referred you to their product, and I’ll get a small percentage of the sale. However, I don’t take your trust for granted, so I only recommend products I’ve used personally and stand behind 100%. This is a test rating!